1. It's cheaper. Ground beef or venison is less expensive than a roast. 2. It's easier to make. Working the jerky gun or rolling the meat out thinly is much easier than wrestling to cut strips out of a piece of meat with bone and connective tissue intact. 3. It's easier to chew. Eating a piece of regular beef jerky can sometimes be like chewing on an old shoe, especially when there's a lot of connective tissue. 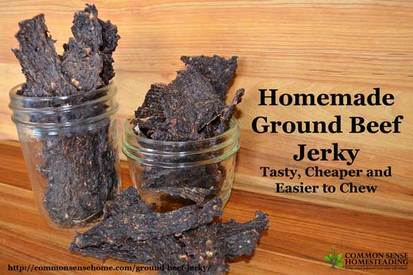 Ground beef jerky has the meaty, salty jerky taste we love without the bits that get stuck in your teeth.